The 8 questions in the risk assessment questionnaire have been designed to appropriately measure your risk tolerance. To help select an investment strategy that is consistent with the way you respond to risk, we have calculated your risk tolerance proﬁle based on your responses to this questionnaire. The completed questionnaire will assist us in placing you into the appropriate risk category. The higher your risk tolerance proﬁle, the more likely you will be willing to take higher levels of risk when making ﬁnancial decisions and accept greater volatility in your investments. It is our policy to protect our clients’ confidentiality and meet our statutory obligations under the General Data Protection Regulation (GDPR) and Data Protection Acts 1988 and 2018. 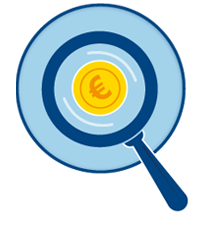 We obtain personal information from you in order that our employees and support service providers can advise you on financial products, which we believe are best suited to your needs, and to comply with our legal obligations. We will not share these details with any third parties. You can have access to the data that we hold about you at any stage on request. Please fill in this form as well as you can. 1. In comparison with other people, I am more willing to make high risk investments. 2. What is more important for you in the context of investments; the risk or the potential gains? 3. What degree of risk would you say you have taken with your PAST ﬁnancial decisions? 4. 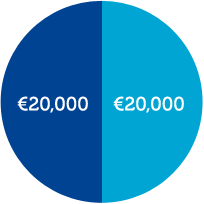 Suppose that you are considering investing €20,000. You are selecting one investment from the six possibilities shown below. There is a 50:50 chance that the investment will decrease in value, in which case you will end up with the amount shown in the dark blue left-hand semicircle. Likewise there is a 50:50 chance that it will increase in value, in which case you will end up with the amount shown in the light blue right-hand semicircle. For example, Investment A will always result in you ending up with your original sum of €20,000, whilst investment F will result in you either getting back €14,000 or €52,000. As you go from A to F your expected return increases but so does your risk. Please indicate (below all the charts) which investment you would prefer. 5. I am prepared to forego potentially large gains if it means that the value of my investments is secure. 6. How would you rate the degree of risk that you are willing to take in your ﬁnancial affairs? 8. 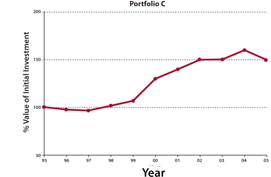 The graphs below show the performance of four portfolios for the last 10 years. 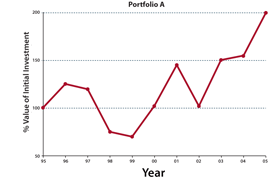 Portfolio A doubled its value over the period, but it made big gains in some years, and suffered big losses in other years. 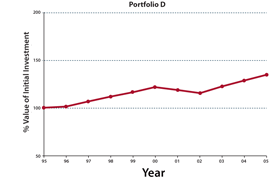 Portfolio D grew by a much smaller amount, but it was steady from year to year. 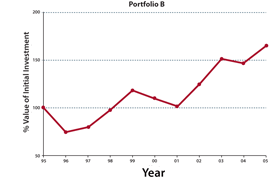 Portfolios B & C are intermediate between A and D both in their overall growth and in year to year fluctuations. The question should only be considered in the context of your overall assessment of risk tolerance because PAST PERFORMANCE IS NOT A GUIDE TO FUTURE PERFORMANCE. You should not use information about the past to make decisions about the future. However, considering your personal circumstances and reasons for investing (pension), which portfolio would you choose for the future? Before discovering your risk profile, to protect against spam, please tick the box to prove you are a person.